A cross of Crocosmia and Tritonia produced this large flowered variety, widely grown for cut flowers. Brilliant orange accented with a red halo-like ring surrounding a yellow throat. The name comes from the Greek language and means "saffron smell", which reportedly can be detected when dried flowers are submerged in water. Brilliantly colored flowers, deep green leaves, blooming in July-August. Wiry stems make it ideal for cut flowers. Plant in a sunny spot. 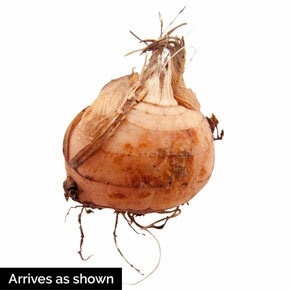 Winter Care: Zones 1-5, bulbs should be lifted and stored indoors over winter. Zones 6-7 mulch to help to protect roots. Zones 8-9 no winter care needed. Flower Form: Funnel shaped blooms. 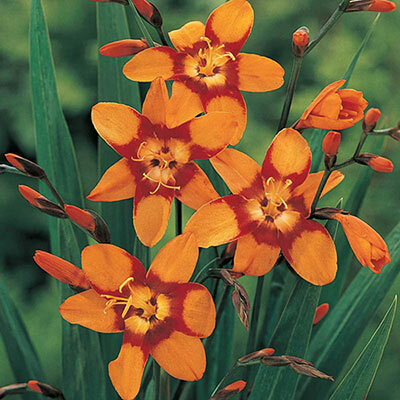 Foliage Type: Medium green, sword-shaped in flattish fan, similar to Gladiolus. Pruning: Divide every 2-3 years. Soil Requirement: Prefers well drained soil.